Eeek time for my MRI brain scan as referred by my neurologist. Despite having taken part in a film for Cancer Research with me being zipped back and forth in and out of an MRI machine it’s not the same as having it switched on and being there on your own. I know that it’s not for long and I just have to lay there without moving but it is weird and unnerving. However another incentive for my being OK with it is that my niece is also having an MRI and said she’d have to wait for me to have mine as I was the grown up! 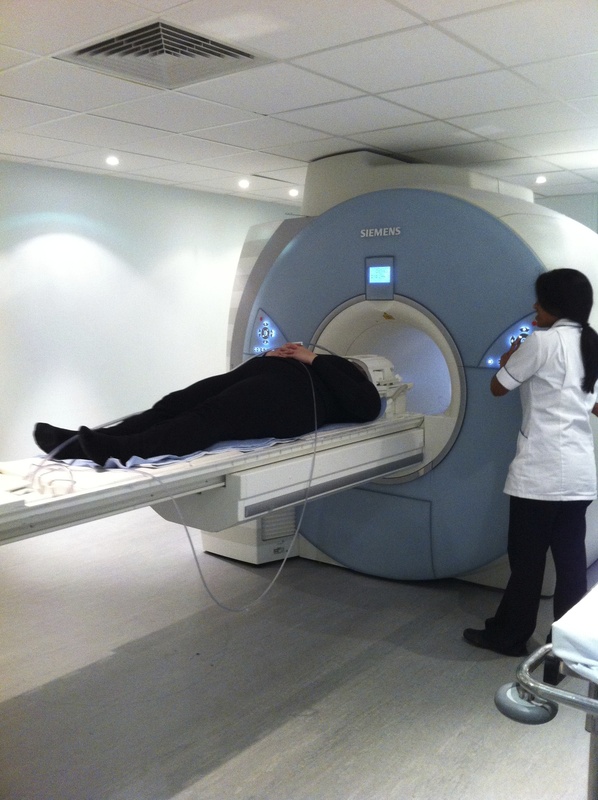 Here’s a little picture of me just before the nurse leaves the room and they slide me into the MRI machine… as you can see my head is already in a cage – eek! Not long (about 15 minutes), very noisy (despite the headphones), jiggles around and claustrophobic BUT incredible machine that can do so much. Now to wait for the results. This entry was posted in My health by AnnaGoAnna. Bookmark the permalink.